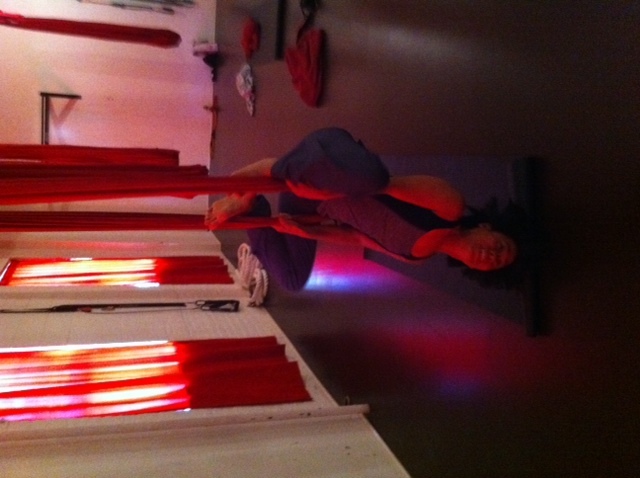 Aerial yoga at South Boston Yoga. Did you know there is Anti-Gravity yoga (a.k.a. Cirque du Soleil yoga or maybe it’s just me that calls it that?!) in Boston? It’s “off-campus” from Newton in Southie but well worth the trip. I was invited to a Boston Parents Bloggers event sponsored by TD Bank as a way of spreading the message that banking can be a relaxing experience. What is aeriel yoga like exactly? Well … you use those long hanging loops of fabric in a myriad of ways: hanging, sitting, standing, dangling upside down, and as a support to stretch. This loop of red fabric is both strong and versatile. It can be used hammock-like to Trazan-like doing traditional poses like Shavasana, Downward Dog, and forward bends. I have to say that lying in Shavasana while ensconced in a cocoon-like hammock was extremely relaxing (except for those with claustrophobia). The lying down poses used the fabric as a hammock but with the fabric fully extended into a swinging bubble-like contraption. Like Vinyasa yoga, we didn’t hold poses for any length of time. The idea is to use gravity both as resistance but in a supported way. In some ways, it reminded me of pole dancing crossed with yoga, what with all the swinging and loss of balance. Or maybe I made this connection because I was out of my element. 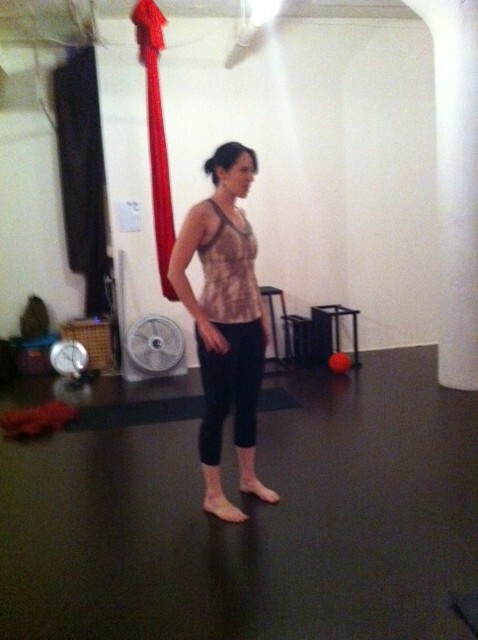 I am used to Vinyasa yoga so this was a yoga adventure for me! It’s also a great core workout which I wouldn’t have guessed but hauling yourself from sitting to standing repeatedly, as well as dangling off to the side on one leg while holding on with one hand does work your core rather well. Most of us had some yoga experience — Mommycosm just got certified as a yoga instructor — but aeriel yoga was new to all of us. The folks from TD Bank were game enough to do it in their work clothes! 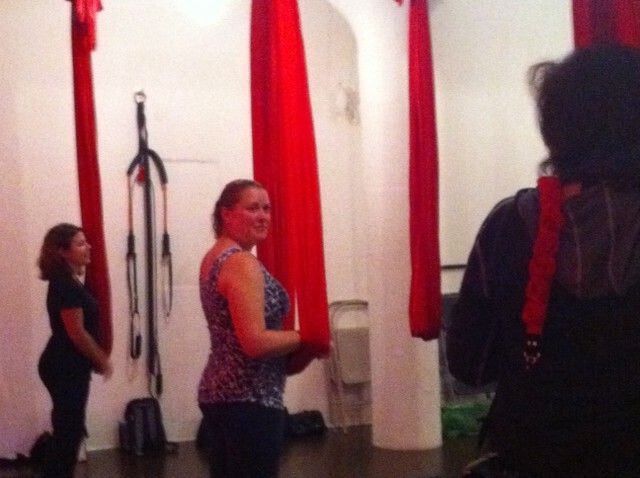 Our instructor assured us that yoga newbies can do this and that you don’t need previous experience as a circus acrobat! MomsFavoriteStuff, Mommycosm and MelanieInTheMiddle (from left to right). As for me, this was the only way for me to do arm balances! Dangling in the air is a lot of fun! I attended a Boston Parent Blogger event hosted by TD Bank where I received a yoga mat and this class as part of a bloggers outreach event. I was impressed with TD Bank’s creativity pairing yoga with banking — not what a typical bank would think of! I left energized with a yoga buzz! Thanks TD Bank! I love that you call it Cirque du Soleil yoga! So fitting. It did feel like we were acrobats, didn’t it? That was fun! It was nice to see you at that event! Will you try it again sometime?